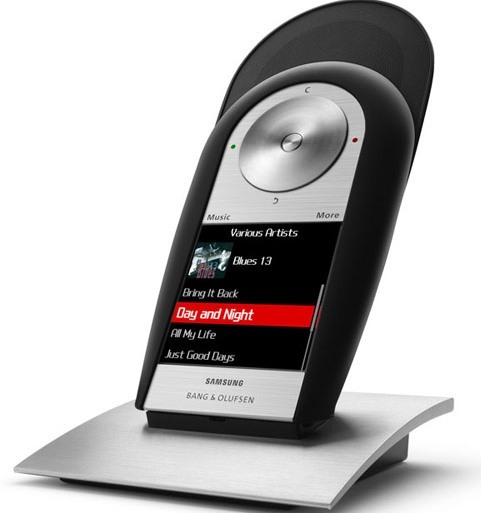 Samsung and Bang & Olufsen have jointly announced their new Serenata music phone which also known as the Samsung SGH-F310. It’s a stylish music-mobile phone with an 2.26-inch LCD (liquid crystal display) touch screen display and 4GB of integrated flash memory to hold your favourite musics/songs (about 1,000 songs). With the large scroll wheel on top of the screen, you’re able to navigate through the user interface of your Serenata music phone. Besides, this 3.5G music cellphone also features a docking station and built-in “Hi-Fi” loudspeaker and bass system, aiming to produce distortion-free amplified musics for up to five hours or around 13 hours through a headset. The cool Serenata Music Phone that measures 63x109x19.7mm is expected to hit the market in coming November but no words on its price yet.